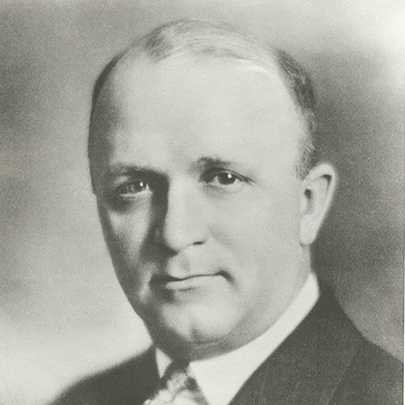 Minnesota native Frank Mars (1883-1934) started out as a candy salesman and eventually began his own Mar-O-Bar Co. in Minneapolis, manufacturing chocolate candy bars. In 1923, he introduced to the public the Milky Way bar, which quickly became the best selling candy bar on the market and his company became Mars, Inc. with $26 million in sales in 1930. The year before, Mars moved the business to Chicago and settled down in an estate home at 930 Ashland in River Forest. Nearby in Chicago's Galewood neighborhood, he built a state-of-the-art plant which still makes candy today. Not only was Mars a businessman, but he was also known to love horses and cattle and ran his own farm called Milky Way, in Tennessee. He would not only breed his horses, but he would also race them. Unfortunately, he did not live long enough to see his most famous horse, Gallahadion, win the Kentucky Derby in 1940. He was a member of various organizations and was honorary captain of the Oak Park police force.